Colored pre-cut data card inserts are pre-cut to size to fit magnetic data card holders. 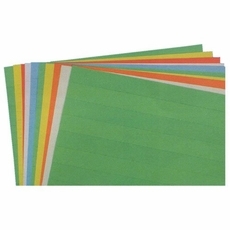 Each size is available in pre-cut widths or in full sheets. Data card inserts come in five different colors or mixed color packs. Use these colorful data cards and insert headings with our Magnetic Data Card Holders to easily update and change information on your magnetic calendar, planning boards or scheduling boards. 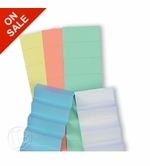 Simply handwrite, type or print information on the colored paper data cards. Slide the information or heading into the cardholder. Managing information has never been easier. on your data cards... do not measure the inside gap! Primary colors: (W) White, (B) Blue, (Y) Yellow, (L) Lime, (S) Salmon, (M) Mixed - equal amounts of each. *3" x 5" cards come in white only.